The President, Shri Ram Nath Kovind lighting the lamp to inaugurate India Water Week- 2017, in New Delhi on October 10, 2017. The Union Minister for Road Transport & Highways, Shipping and Water Resources, River Development & Ganga Rejuvenation, Shri Nitin Gadkari, the Union Minister for Drinking Water & Sanitation, Sushri Uma Bharti, the Minister of State for Parliamentary Affairs, Water Resources, River Development and Ganga Rejuvenation, Shri Arjun Ram Meghwal and the Minister of State for Human Resource Development and Water Resources, River Development and Ganga Rejuvenation, Dr. Satya Pal Singh are also seen. 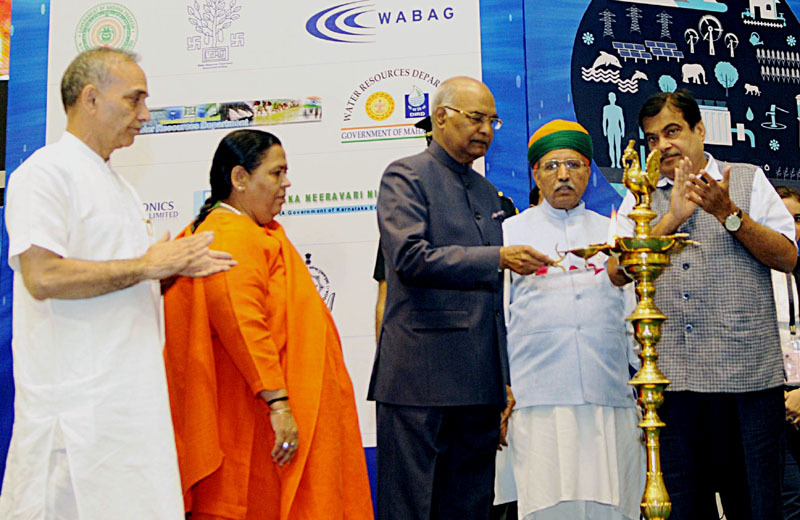 New Delhi: President of India, Shri Ram Nath Kovind, inaugurated India Water Week-2017 today (October 10, 2017) in New Delhi. The President said that currently, 80 per cent of water in India is used by agriculture and only 15 per cent by industry. In the coming years, this ratio will change. The total demand for water will also rise. Efficiency of water use and reuse, therefore, has to be built into the blueprint of industrial projects. Business and industry need to be a part of the solution. The President said that access to water is a byword for human dignity. For India, providing safe drinking water to a population spread across six hundred thousand villages and urban areas is not just a project proposal. It is a sacred commitment. The government has prepared a strategic plan for ensuring drinking water supply in all rural areas by 2022, when India complete 75 years of Independence. By that year, the goal is to cover 90 per cent of rural households with piped water supply. We cannot fail. The deliberations of this conference have to ensure that we do not fail. Among the dignitaries present on the occasion were Union Minister for Road Transport & Highways, Shipping, Water Resources, River Development and Ganga Rejuvenation, Shri Nitin Gadkari; Union Minister for Drinking Water and Sanitation, Sushri Uma Bharti; Minister of State for Parliamentary Affairs and Water Resources, River Development and Ganga Rejuvenation, Shri Arjun Ram Meghwal; and Minister of State for HRD and Water Resources, River Development & Ganga Rejuvenation, Dr Satya Pal Singh.